A betting man would have lost on Saturday, where the odds were on, that Bloemfontein teenager Stuart White would fly home from Cape Town with the Investchem Formula 1600 championship and its Road to Indy prize firmly in his back pocket. It was however not to be. White delivered the goods, qualifying second and winning the first heat after passing pole man Scott Temple (Road to Race Mygale) to win through an early summer Cape Southeaster, while championship rival Nicholas van Weely (Magnificent Paints & Hardware van Diemen) only came home sixth. That meant that all Stuart had to do, was either beat, or follow Nick home in heat 2. White started fourth in heat 2 behind van Weely, who moved into second on the opening lap while White took some time to pass on form local lad, Joshua Dolinschek (Makita Mygale) as Temple sped off out front. White eventually passed the combative Dolinschek and closed up on van Weely, who did all he should to keep his championship rival behind, knowing that White would still take the title if he followed him home. But the racer in White came out as he made a last ditch move to get by van Weely on the final corner of their final lap and went off, plummeting to seventh in the process as he threw away the chance to clinch the championship in the Cape. The title fight now goes on to be decided at the Zwartkops season finale Saturday 20 October. It was a very good race for Cape drivers as two young home heroes, Andrew Rackstraw (Investchem/RDSA Mygale) and Dolinschek (Makita Mygale) scored their maiden Formula 1600 podiums in the two races, while Franschhoek driver Ian Schofield kept his Class B title on track with a class win and a second. Temple started in pole position ahead of White, Rackstraw and Dolinschek, while Alex Gillespie headed up the third row in his ERP Trucking Components Mygale ahead of van Weely, the returning Liam Pienaar (Pheonix Jewellers Fantastic Racing Mygale) and Tiago Rebelo (TRMS Mygale), while Investchem Mygale son and dad duo Andrew and Class B championship leader Ian Schofield rounded off the top ten on the grid. Siyabonga Mankonkwana (Cervinia Investments/Max Q Mygale) qualified 11th ahead of Class B man David Jermy (Beauty Factory Mygale), Brendan Tracey (Investchem Mygale), Gerard Geldenhuys (Abacus Divisions Mygale) and Allen Meyer (van Diemen). Gerald Wright suffered a significant accident in qualifying and while he escaped with nothing more than a few bruises, his battered Fantastic Racing Mygale was out for the day. The first Southeaster of the season was howling as Temple led away with White in hot pursuit ahead of Rackstraw, Dolinschek, van Weely and Gillespie. Van Weely and then Gillespie found a way past Dolinschek and behind them, Pienaar, Rebelo and the Schofields took advantage of Mankonkwana slipping off after a demon start. White relieved Temple of the lead in a clean move at mid-distance, but he was struggling with a sticky throttle, while Gillespie passed van Weely for fifth a lap later to leave White literally touching that title after that hard-fought win. Rackstraw drove a solid race to third ahead of Gillespie, van Weely and Dolinchek, while further back, Rebelo and Andrew Schofield made it past Pienaar, who ended ninth ahead of Mankonkwana, Class B men; winner Ian Schofield, Jermy, Geldenhuys and Meyer after Tracey hit trouble early on. Temple made no mistakes as he left all behind him as he blasted from pole position to a lights to flag heat 2 win. The draw began at lights-out as Rackstraw was left on the grid off his maiden front row start to leave Cape compatriot Dolinschek in second, before van Weely found his way past, so Temple led van Weely, Dolinschek, White, Gillespie, Rebelo and Mankonkwana ahead of a busy midfield spat. Championship wise, White needed to only pass Dolinschek and follow van Weely home to clinch it and while young Joshua made Stuart work for it, White made it stick on lap 3, before chasing van Weely down and then doing all he could to pass his title rival. Stuart was likely unaware that simply following Nicholas home would hand him the title as he made a move at the last corner, only to slip off and drop down to seventh and well behind winner Temple and van Weely, who lived to fight another day for that championship. A delighted Dolinschek came home third ahead of Gillespie, Rebelo and Rackstraw, who fought back after his startline faux pas and White. Andrew Schofield ended up eighth from Pienaar and class B top two, David Jermy and Ian Schofield; Tracey, Meyer and Geldenhuys after Mankonkwana buried himself in the Turn 1 sandpit on lap 7. So Temple took the day overall from van Weely, Dolinschek, White and Rackstraw, while Ian Schofield took Class B from Jermy, Meyer and Geldenhuys. All of that still sees the Investchem Formula 1600 championship and that Road to Indy prize there for the taking, as Stuart White leads Nick van Weely by 19 points with 22 still on the table. That suggests it should be a simple task for White, but stranger things have happened — as they indeed did this past weekend. Scott Temple’s overall win meanwhile consolidated his championship third over Alex Gillespie, but that one is also up for grabs and while Ian Schofield leads class B, David Jermy is ahead of him in the overall title race, so there’s another key Investchem Formula 1600 battle. 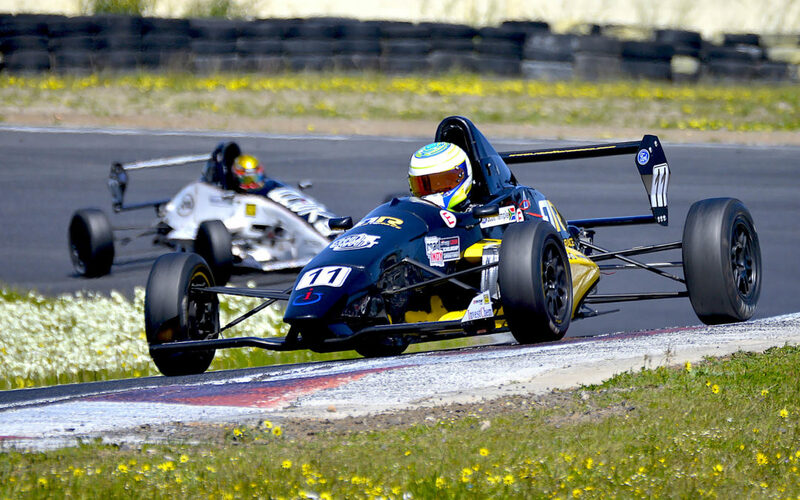 All of which means the Investchem Formula 1600 championship is all to play for at Zwartkops Saturday 20 October — now that’s one to diarise right now!